What if...You Now Know What You’re Missing? SocialGood: What if…You Now Know What You’re Missing? Two months ago, I travelled back to Arusha, Tanzania as part of my work with Mom2Mom Africa. Each time I am in Arusha, I make sure to stop by a local outdoor restaurant frequented by many tourists. The restaurant resides on a beautiful piece of property, and offers free Wifi to connect back home to loved ones. I consider this to be a real luxury in the areas I work in Arusha so take full advantage of this establishment whenever possible. On my last trip, I decided that I would take several of our Mom2Mom Africa students to this restaurant as a “treat”. What was originally planned as a small group outing with 5 or 6 children, ended up turning into a van full of children, and my colleague Aloyce. It was absolutely priceless to see me walk through the grounds followed by 12 little Tanzanian children, and Aloyce at the rear to ensure we didn’t lose any along the way! The other restaurant patrons could not stop staring! I had questioned this dinner outing for days before making a decision to go ahead with it. Many believe that exposing those in poverty-stricken areas of the world, to ‘luxuries’ is unjust; a tease. I didn’t want to be that white foreigner. But, after much thought, I decided to go ahead with our big dinner date. What influenced my final decision was the fact that the same holds true for my three little girls in Canada. As a mother, I often treat my girls to little extravagances. These are not every day occurrences, and in fact are more rare than common. And my girls understand that. If they could be treated each and every day, there would be no argument on their part. But, they know that even though that might be the reality of other little girls their age, it is not their reality. And they are ok with that and simply choose to enjoy the times that they do get to experience trips or dinner at fancy restaurants. I used this experience with my girls as the deciding factor in Tanzania. After all, everyone likes to be treated! 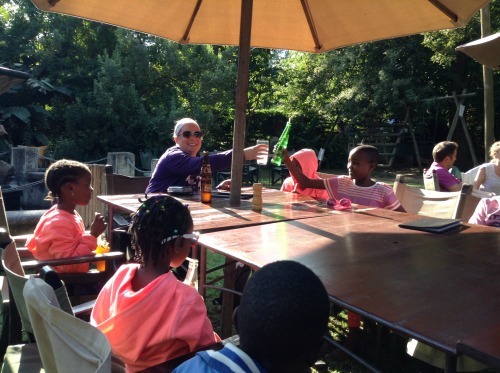 Seeing the kids eat pizza until their bellies were full, drinking pop, and laughing with their friends was one of the highlights of my time in Tanzania. When they noticed the playground with swings and teeter-totters, I lost them in play for 2 hours! They were beyond happy. And, that made me beyond happy. And, at that point, I thought to myself that I had made the right decision. I left the restaurant on cloud nine, with twelve happy little ones singing all the way home in the van. All had gone as planned, until one little girl said out loud in the van…”I now know how mzungus (white people) live”…and my heart broke. The restaurant is staffed with locals but caters to tourists, most of whom are white. Instead of this being a fun night out for all, Canadians and Tanzanians alike, the take home message was that white people deserve and live in a world of luxuries. My plan back-fired on me with a vengeance. It has been two months since that night, and that little voice from the back of the van still haunts me. I guess my mommy instinct was off this time. We all worry about making decisions that may negatively affect our own children’s lives. I now worry constantly about my decisions and how they may impact the lives of so many who call me “Mama Alison” in Tanzania. Do you think it’s better to know what you are missing or not? This is an original post written for World Moms Blog by Alison Fraser. Photo by Alison Fraser. « NETHERLANDS: Where Do We Draw the Line? Wow, that’s a tough one, Alison. I believe that your intention is what counts. You had the pure intention of giving them a treat, and they had a lovely time. I would have told that little girl that not all mzungus live like that, and that the colour of skin means means nothing! Apart from that, they now have a lovely memory and story to tell for years to come, about the fun they had with Mama Alison! When I worked as a Tour Guide, I got to experience things that (to this day) I can’t afford. I went for a ride in a helicopter because I had to accompany a group of rich Italians. Another time I got to sleep in a Private Game Reserve and accompany another family on Game Drives. I would LOVE to be able to do that with MY family, as a tourist and not the “hired help” at the beck and call of others! Still, I cherish those experiences, and I hope that one day I will be able to afford to go there with my family. By the way, there were PLENTY of “black” tourists enjoying the same Private Game Lodge that I can’t afford! Skin colour means NOTHING!! Do not beat yourself up about this! You are doing AMAZING work. The children you took on the lunch outing deserve that life, too. You have opened their eyes up to more of the world. And you are helping them get the education they need to live a better life. I am sooooo proud of you!!! Thank you for sharing your story so candidly with us!